Reading can be so much fun; take you places that you've never been or that don't even exist. But once you've been there you want to remember it. You want to be able to share that experience with others. This part of reading is not only critical to comprehension and success in school, it is a very social skill. It is so important to be able to accurately retell a story you have heard or read. Think about having someone who has difficulty recalling details, tell about what happened in the last movie they saw. You either have no idea what actually happened or you only get a vague idea and you have to work very hard to complete the story in your own mind. You probably won't be very excited about seeing that movie. Now, think about it in terms of a story. If your child has difficulty remembering the details of the story- the plot, the main characters or the general idea (main idea) of the story- they will be less excited to tell you about it and won't be eager to read it again. We want children to be excited about reading and remembering stories so that they are willing and eager to read them again and tell other's about them. 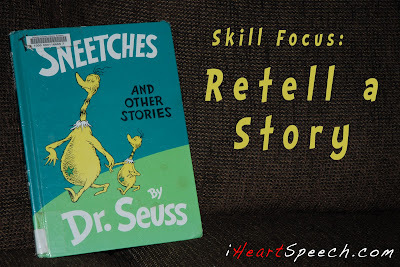 I have created a short exercise that will help you address the reading skill of Retelling a Story. Get it here. Remember that at each age level, the skill should get more and more detailed! First, I would start the story with an overview (which means you need to read it over first!). This gives them the main idea right off the bat. Then read the story. You can point out important bits of information as you read. While you are at it, use the words that they'll hear in school. If words like "characters" and "plot" are going to be discussed in school, give them a head start by using those words in your discussion of the story. I would say something like "oh, look a new character!" or "that's an important part of the plot." Exposing your child to these words makes them familiar so they can learn what the plot is or who the new character is, instead of thinking about the concept that is being asked. Ok, next, when you are finished reading the story ask a few questions. I like to start with main idea type questions. This tells me if the child understands the big picture. If they do not, then you can ask the detail questions and that may help them be able to "get" the main idea. Details from the story are more specific questions where you are looking for a certain answer directly from the story. They can be about events (sequence) or characters. Finally, since this is a partially a social skill, I would encourage you to have your child try to tell another person about the story in his own words. Maybe tell dad when he gets home or call an Aunt on the phone. See if he is able to stay on topic, tell enough details that the other person can understand the story and tell the story in a logical order. Make sure you check out the page that describes exactly what your child should be able to do at his or her age! You can see that skill (and other reading skills) here. You can also get a printable version of it here. Don't forget the questions page (here). If you have other age children in the house, who are not currently working on retelling a story, I still would like to encourage you to get them involved. Here is my littlest taking part as a Star Bellied Sneetch! Get the whole family involved with reading! Make it social and something you talk about with each other. Most importantly... have fun!